From the start of the year to the middle of last month, I spent four and a half long months discussing how over-inflated "yielding" assets had become with a steady focus on U.S. stocks and bonds. Every week I would put up both sentiment and fundamental valuations showing how manic each had become. Then the following week sentiment levels would become more manic and valuations would become even more absurd as both stocks and bonds pushed higher and higher and higher. How long was I prepared to continue this discussion? Forever, I guess. If an asset is overvalued and it moves higher in price then it becomes less fundamentally attractive. I was ready to continue the endless brigade of charts, fundamental valuation, and rational thinking on through eternity as we watched these bubble credit markets move higher, and higher, and higher. Then in the middle of May something very strange happened. Stocks and bonds both started to fall simultaneously around the world, including even in.....gasp....the United States of America? Was that possible? The following is Barclays U.S. Bond Index, which has now wiped out an entire year's worth of gains in just a matter of weeks. 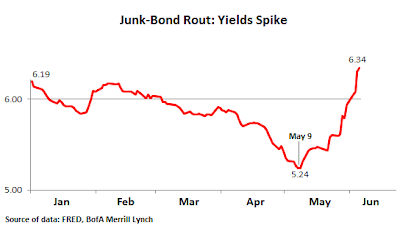 Junk bonds, the recent darling of the high yield mania in the United States, reached a historic high yield May 9 at 5.24%, and have since fallen off a cliff crushing any late entrants (over the last year) to the party. 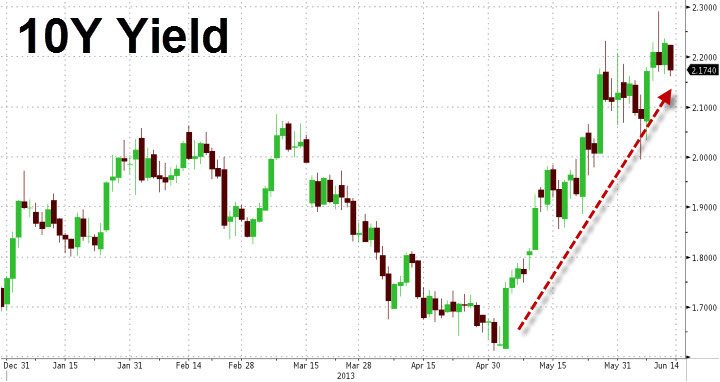 As a reminder, interest rates rising means that bond prices are falling. 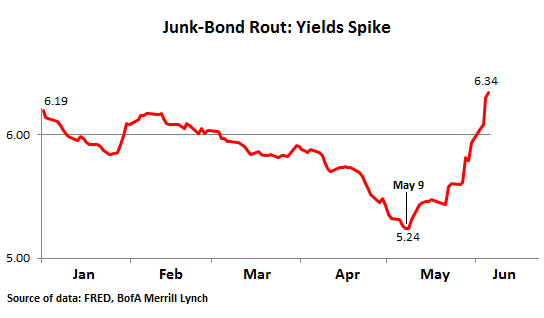 While it is impossible to know the future, I believe the winning bid for bonds at 5.24% on May 9, may be end up being the highest price paid for junk bonds in a generation. Something that was perfectly normal just 30 days ago will be looked back on in the financial history books with complete awe years from now. Outflows in the bond mutual funds can be seen in the weekly data where over the last two weeks there has been a full blown rush for the exits after years and years of relentless inflows. It has been often repeated that as money moves out of bond funds it will quickly find a home into the stock market, a term that has become known as the "Great Rotation." 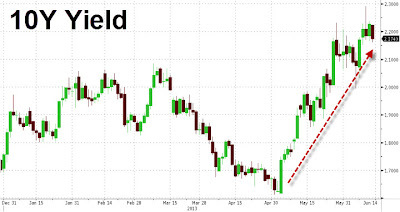 As the bond markets began to unravel last month everyone got their popcorn out to watch the stock market explode higher to new endless daily, hourly, and minute by minute record highs in price. Then? Stocks unimaginably started to fall with bonds. This may only be a preview of the main event coming, but this major trend of both stocks and bonds falling together will be the black swan event that no one has prepared for. The following chart shows mutual fund flows in 2013, where investors recently have been exiting stock and bond funds simultaneously. Where has the money moved? The place that we have been discussing here on this site as the most attractive investment all year long, the formerly most hated place on earth; cash. Mutual fund flows have soared over the past few weeks as investors have begun to get worried about these so called "risk free" high yielding assets that have somehow found.....risk? As I just mentioned, a year's worth of bond gains were wiped out in just a few trading days. What took years of advances for the U.S. stock market climb from 2002 through 2008, took only a few months to completely wipe out. Selling has a way of having a liquidating, waterfall type effect in the market due to both mass psychology and the use of leverage. This is why when markets are most complacent they are the most dangerous. The recent decline in utility stocks, one of the darling sectors of the higher paying dividend stocks, took just a few weeks to wipe out 2.5 years worth of dividend payments. Can the markets find a footing and charge back higher to new insane valuation and sentiment levels? Absolutely. What would that mean for stocks and bonds? That they would be far more dangerous. I can imagine the same type of mentality during the peak of cyclical tops during the last secular bear market from 1966 to 1982 in stock prices (seen below). We are currently 13 years into the current bear market. 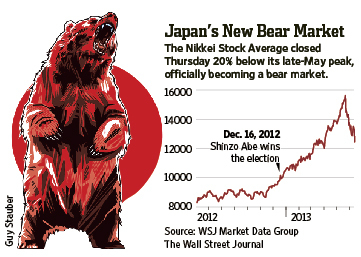 History shows that secular bear markets have lasted for 17.6 years. Will this time be different? It is going to take a once-in-a-generation type of cleansing in these markets to bring them back to attractive valuation levels, which we were close to having in both 2000 and 2008 before the government and Fed stepped in to try and artificially push markets higher. The third and final sell-off will be by far the most violent because this time around both the governments and central banks will be all-in before the declines even begin.